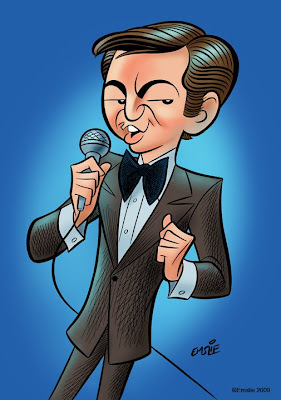 The Cartoon Cave: Happy Birthday Bobby Darin! Last year at this time I observed the 10th anniversary of the death of my favourite singer, Frank Sinatra. Not long thereafter, I discovered that May 14th coincidentally also happened to be the birthdate of my second favourite singer of all time: Bobby Darin. Despite his breezy and hip onstage persona, Bobby led a pretty rough life. As a young boy he was bedridden for some time with rheumatic fever, a disease that recurred and left him with a weak heart. Doctors at the time didn't give him much chance of living beyond the age of 16, but Bobby was determined to prove them all wrong and set out to pack a lot of living into what time he had left, keeping a sharp focus on becoming a big name singer and musician. In addition to singing, he learned to play guitar, drums, harmonica, vibes, among other talents, and all of this he did well, adding film acting to his portfolio a short time later. Originally he started out as a typical 50s rock 'n' roller, being groomed by his record label to follow in Elvis's footsteps. But Bobby had set his sights on being more of the nightclub performer, aspiring to give Sinatra a run for his money. Despite his becoming a crooner in the popular style of the day, the rock 'n' roll side may have given him a bit of distinction though, as there was often an edginess in his choice of material, delivered with a particularly sardonic flair. His big hit, Mack the Knife is a about a murderous thug, yet sung with a morbidly humourous, swinging beat. Both Clementine and Artificial Flowers take a similarly light approach to stories of tragic deaths, and I sometimes wonder if it was Bobby's sense of his own impending mortality that informed this almost detached and satirical bent in his rather dark subject material. I must admit, I was never as keen on Bobby Darin's later work as a politically active folk singer (adopting "Bob Darin" as his more mature stage name), although I certainly give the man credit in his admiration and efforts for Bobby Kennedy, Martin Luther King, and the civil rights movement of the turbulent 60s. Bobby himself may have tired of the tuxedo and nightclub style of singing but that is still what most of his fans love him for the most. He came to realize it too, as he found that the folk songs weren't enough to keep him in the public eye and he'd gone into recluse for some time following the assassination of his friend RFK, but he eventually went back to the stage as Bobby Darin once more to popular acclaim. Sadly though, shortly after appearing in a televised concert for NBC in 1973, Bobby Darin died of heart failure in December that same year at the tragically early age of 37. I wonder what greatness Bobby would have been capable of had he lived a normal lifespan. Here is a clip from that televised concert featuring Bobby Darin singing my favourite of his many hits: Beyond the Sea. Goodbye Charlie - classic song.. Thank you for remembering him.. I love the subtle modeling on the face. Has a cool deco look. David - I must confess that I am completely unskilled in painting digitally with Photoshop. I see myself as one who draws and then colours it in. As such, what rendering you see is just simple airbrush effects on top of flat areas of colour. Being far more comfortable with real brushes, ink and paint, I still maintain a less than high regard for the Photoshop tools and my dabbling in digital painting has produced rather dismal results. Oh wow, I wasn't aware that Sinatra had died so recently. I guess it shouldn't surprise me, I remember his comments towards Sinéad O'Connor after her who Catholic Church production and I guess that wasn't all that long ago. I don't think I've ever listened to Bobby Darin, but I'll have to look into him. I think I made it to the end of this year on the backs of Frank Sinatra and Tim Horton, so if the two are anything alike it'd be worth it. He's just got so many songs about living through the bad times to get to the good times, and sometimes that's what you need to hear. Love him too! This is great! Hi Pete! Thanks for the comment on my blog and for directing me to this link. I LOVE the artwork you did of Bobby! It totally captures him and like another commenter said, gives him a cool art deco look. Thanks for reading Go Retro and Happy New Year!